Objective: In this study we aimed to evaluate the relationship among the quality of life, functional capacity, physical activity and performance levels of individuals with chronic venous disease (CVD). Methods: 210 individuals with CVD grade I-V according to the CEAP classification were included in the study. Functional capacity of individuals was evaluated by the 6-minute walk test (6MWT) and heart rate, blood pressure and oxygen saturations were assessed before and after the 6MWT. Physical activity level International Physical Activity Questionnaire (IPAQ), performance level sit-to-stand test and Quality of life VEnous INsufficiency Epidemiologic and Economic Study on Quality of Life Questionnaire (VEINES-QoL). The data for the study was calculated using the SPSS 20.0 package program. Results: The study consisted of 143 (%68,1) female, 67 (%31,9) male individuals. The average of age was 39,2±10,1 and body mass index (BMI) was 27,9±6,32. Quality of life has significant positive and low correlation with performance level (r = 0.161 p <0.05), physical activity (r = 0.178 p <0.05) and functional capacity (r = 0.171 p <0.05). In addition, there was a significant positive and moderate correlation in functional capacity with performance (r = 0.521 p <0.001). Conclusions: CVD has been reported as an important health problem that negatively affects the life quality of individuals (1). In individuals with chronic venous disease, the quality of life decreases when physical activity, functional capacity and performance are low. Considering the negative impact on public health due to high prevalence, we think that the data obtained in more cases can explain the evaluations in this study better. Certain complaints such as venous hypertension that occurs as a result of valve insufficiency and allows blood circulation to retard and varicosis which are formed by impairing tissue nutrition, pain, cramps, edema, itching, pigmentation, venous ulcers are observed. Overall decrease life quality. However, there is no wide study that researched quality of life, functional capacity, physical activity and performance levels in CVD patients. Therefore, the aim of this study to evaluate the relationship between quality of life, functional capacity, physical activity and performance levels of individuals with chronic venous disease. Individuals were 210 CVD survivors, who referred to Research and Education Hospital, Cardiovascular Surgery clinic in Izmir and Gaziantep, Turkey. Inclusion criteria were (i) aged 18 to 65 years; (ii) confirmed CVD stages I-V. Exclusion criteria were having (i) active ulceration (clinic stage VI), (ii) neurological and musculoskeletal disease history, (iii) metastatic condition presence, (iv) severe cardiac insufficiency and/or rhythm disorder diagnosis, (v) advanced psychological impairment, (vi) vestibular system problem, (vii) severe visual loss, (viii) chronic alcohol use history, (ix) pregnancy situation or (x) long-term cortisol treatment. Required permissions were obtained from local ethical committee and the patients were informed about the evaluations to be carried out and the purpose of the study and informed consent was acquired before inclusion. This study was a cross-sectional prospective study. All tests were performed by the same physiotherapist and all evaluations lasted about 30 minutes. The patients were given resting periods between the tests. 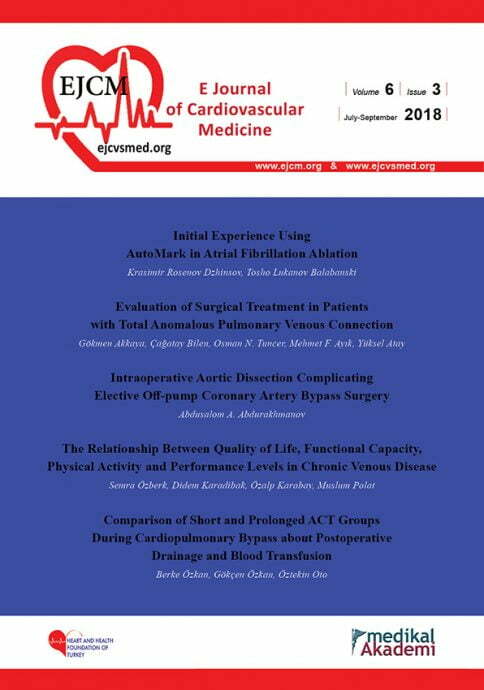 Sociodemographic-clinical characteristics and CVD related data were assessed face to face interview and obtained from the records of cardiac surgery archive. All data were analyzed using SPSS 20.0 package program. Defining criteria were presented as average and percentage distribution. The validity of normal distribution of data was controlled with Kolmogorov-Smirnov test. Pearson and Spearman Correlation Analyses were used to evaluate the correlation. For significance level, it was regarded as p<0.05. Initially, 254 patients diagnosed with CVD were recruited to the study. 226 (89%) fulfilled the inclusion criteria. But, 16 individuals could not complete the tests and questionnaires given to them. Therefore, this allowed data to be obtained only on 210 participants. The mean age and body mass index (BMI) of 210 (67 male, 143 female) individuals was 39,2±10,1 years (mean±SD) and 27,9±6,32 kg/m2, respectively. 47% of individuals were stage II. 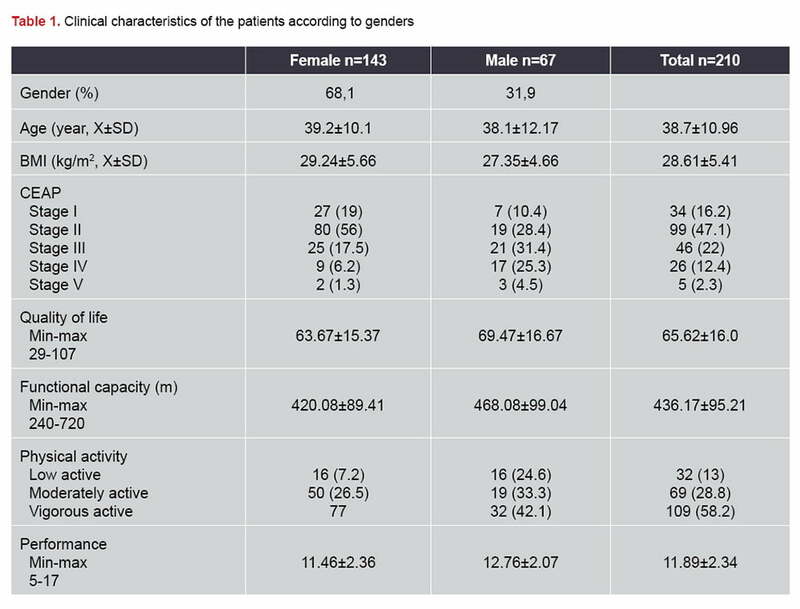 Demographic and clinical characteristics of individuals are presented in Table 1. Quality of life has significant positive and low ­correlation with performance (r = 0.161 p <0.05), ­physical activity (r = 0.178 p <0.05), functional capacity (r = 0.171 p <0.05). In addition, there was a significant positive and moderate correlation in functional capacity with performance (r = 0.521 p <0.001) Table 2. In this study, we assessed quality of life, functional capacity, physical activity and performance level of CVD patients. Performance level and functional capacity had significant correlation in CVD patients. 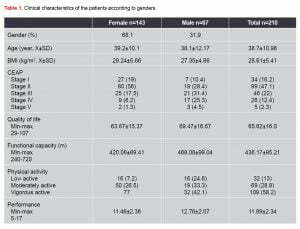 When gender distributions of participants with chronic venous disease are examined, women form the majority of the patients. Hence, in a study performed by Fiebig et al. (2010), it was determined that female population accounted for 70% of the cases with venous disease. (11) In parallel to this, the number of females was identified to be higher (67%) in the present study, as well. Although venous disease was emphasized to be a chronic disease affecting the quality of life negatively, it is stated that studies regarding this issue are still needed. In patients with chronic venous disease, it is reported in many studies that since it affects both physical and psychological health negatively, it reduces life quality. (14,15) In a study conducted by Dias et al., the quality of life in participants with and without venous ulcer was compared and the group with venous ulcer was discovered to have a connection with lower physical health and insufficient functional capacity. (16) It was noted in this study that when symptom severity and rate increased in patients, their quality of life decreased and they had lower social and psychological effects. Conditions such as having more subjective evaluation batteries in the study and lower education level of patients diminish the competency of this paper in terms of that tests could be dealt with adequately and effectively. Nevertheless, as patients with chronic venous disease approached functional sufficiency with a broad perspective, it is an important study that it contributes to literature. CVD has been reported as an important health problem that negatively affects the life quality of individuals. In individuals with chronic venous disease, the quality of life decreases when physical activity, functional capacity and performance are low. Considering the negative impact on public health due to high prevalence, we think that the data obtained in more cases can explain the evaluations in this study better. Beebe Dimmer JL, Pfeifer JR, Engle JS, et al. The epidemiology of chronic venous insufficiency and varicose veins. Ann Epidemiol. 2005; 15:175-184. Allan PL, Bradbury AW, Evans CJ et al. Patterns of reflux and severity of varicose veins in the general population Edinburgh Vein Study. Eur J Vasc Endovasc Surg. 2000; 20:470-477. Chiesa R, Marone EM, Limoni C et al. Chronic venous insufficiency in Italy: the 24 cities cohort study. Eur J Vasc Endovasc Surg. 2005; 30:422-429. Eklof B, Rutherford RB, Bergan JJ et al. Revision of the CEAP classification for chronic venous disorders: consensus statement. J Vasc Surg. 2004 Dec; 40(6):1248-52. Moura RM, Goncalves GS, Nayesro TP, et al. Relationship between quality of life and the CEAP clinical classification in chronic venousdisease. Rev Bras Fisioter. 2010 Mar-Apr;14(2): 99-105. Epub 2010 May 14. American Thoracic Society. ATS Statement: Guidelines for the six-minute walk test. Am J Respir Crit. Care Med. 2002; 166: 111-117. Johnson MJ, Close L, Gillon SC, et al. Use of the modified Borg scale and numerical rating scale to measure chronic breathlessness: a pooled data analysis. Eur Respir J. 2016 Jun;47(6):1861-4. Catarinella FS, Nieman FH, Wittens CH. An overview of the most commonly used venous quality of life and clinical outcome measurements. J Vasc Surg Venous Lymphat Disord. 2015 Jul;3(3):333-40. Panagiotakos DB, Polystipioti A, Polychronopoulos E. Prevalence of type 2 diabetes and physical activity status in elderly men and women from Cyprus (the MEDIS Study) Asia Pac J Public Health. 2007;19(3):22-8. Andreozzi GM, Cordova R, Scomparin MA, et al. Quality of life in chronic venous insufficiency. Int Angiol 2005;24:272-7. Franz A, Wann-Hansson C. Patients’ experiences of living with varicose veins and management of the disease in daily life. J Clin Nurs. 2016 Mar;25 (5-6):733-41. Catarinella FS, Nieman FH, Wittens CH. The relation between clinical scores and quality of life in long-term follow-up. Phlebology. 2016 Mar;31(1 Suppl):99-105. Dias TYAF, Costa IKF, Melo MDM, et al. Quality of life assessment of patients with and without venous ulcer. Rev Lat Am Enfermagem. 2014 Jul-Aug; 22(4): 576–581.